As you all know, we just came back from a 9 day trip to Florida. If you had been following our Facebook and Twitter accounts, you would know that we managed to get over to Universal Orlando for 2 days while we were there. This was the first time in nearly 6 years for me, and in over 10 years for Jon, since we had last visited! As you can imagine in the Orlando theme park industry, a lot had changed in that time! We hired a car to UO, which we did through National/Alamo at the Car Care Center (CCC) near the Magic Kingdom. If any of you have ever considered hiring a car, but not sure how to go about it, I have to say we were impressed with how easy it was. Check with guest services at your resort for the pick-up times, and arrange a time if needed. Then, wait out front of the hotel at your allotted time, and wait for the shuttle (clearly marked, and normally blue). They take you directly to the CCC, which in the twice we were there was never busy. We got our car, and left. The roads around WDW are really easy to navigate, and the CCC will give you maps etc if needed. When you return the car, go back to the same place, and the shuttle can drop you off anywhere you want on WDW proprty! UO is about a 20-25 min drive straight up the I4 from WDW, and is clearly signposted. Heading in from the south (WDW), you will be directed more or less right into their main car parking structure. Once you've parked in one of the two immense structures, there are moving walkways that take you to a mid-point where there are bag checks, before you then proceed down the final moving walkway into Universal's equivalent of Downtown Disney, Universal CityWalk. Remember where you parked, too. There are signs that tell you which level and lot you are in. CityWalk is a fun and lively area, which in the day offers some good lunchtime dining options and more relaxed shopping, and by night offers sizzling sounds and hot restaurants and venues. From CityWalk you then have the choice of heading to either Universal Studios (US), or Universal's Islands of Adventure (IOA). The first and main thing we wanted to experience was the new Harry Potter attraction and land over at IOA; and that is where we headed first. We had bought the special priced print at home tickets and therefore headed right to the turnstile where our paper was scanned and we walked on in. Now, Islands of Adventure works on the premise that each port of call - or Island - has it's own distinct identity and it's own story to tell. The first port of call you arrive in is Port of Entry. Here you will find unique boutiques and eateries, as well as all the usual guest service areas normally found at the entrance to a theme park. Port of Entry is also the place to meet Woody and Winnie Woodpecker in their explorer outfits. I really like Port of Entry, and think that they did a really good job of it. It is well themed and offers a good selection of stores and merchandise. The problem with UO as a whole though, is that they are quite expensive - more so than Disney, I thought. There also isn't the same attachment to some of what they sell as with at a Disney Park, simply because they use many characters from other companies and brands - a lot of which are quite modern. I just didn't have the same affection for their stuff as Disney. But, they did have some neat stuff, and Port of Entry was definitely the place for shopping. They even have a dedicated Christmas store, much to my delight! 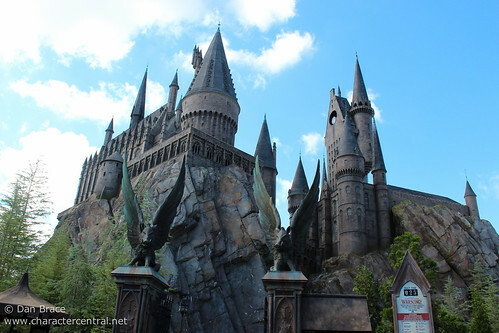 So, we headed over to the Wizarding World of Harry Potter (WWofHP). I have to say that upon arrival, it is quite impressive. The view of the village and castle towering above make quite the impression. They have a number of stores which are all lifted right from the books/movies and a main counter service restaurant - the Three Broomsticks. All of the stores are generally VERY small and intensely crowded. the WWofHP is MEGA popular to say the least, We were there during an off peak time, when Disney was dead, and yet there were thousands of people right there in the WWofHP. It made the experience somewhat marred. I found all the areas of WWofHP very small, cramped and not very well organised. They have two other attractions before we talk about the main one. Both of which are re-themed roller coasters from the past. Neither scream Harry Potter to me, especially since I know what they were before, and they don't really fit well with the rest of the area, in my opinion. The Three Broomsticks was pretty good, and although crowded, the line moves quickly. They serve "British" food (questionable as to how authentic they think they are... but anyway! ), and Butterbeer. You can also buy Butterbeer outside at a cart, but the line for that was generally as long as the one inside (the difference being that at least inside has seating and AC!). The food was good though, and we enjoyed what we had. For anyone who has been to the Warner Bros. Studio Tour in North London, if you tried the Buttterbeer there, then I hate to disappoint you, but both Jon and I thought the Butterbeer in WWofHP was a lot better, and tasted more like how we expected it to! And now to what you have all been waiting for, right?! My thoughts on the main attraction, The Forbidden Journey. From the outside, Hogwarts looks very neat. There are two issues with the outside though. One is that UO actually aren't as good at the upkeep of attractions as Disney, and the structure has already started to show signs of wear and tear with no thought to repair it. The second thing is that it lies right on the path that leads to the Jurassic Park area... You can hear the JP music BLARING out from the left side as you stand in front of Hogwarts, and it really spoils the illusion. I'm not sure why they feel that music along that path is necessary, as it isn't really the JP area until you walk some way down it! Weird. You enter through the base of the rock, which is also odd, but we'll go with it. As you enter you HAVE (NO choice) to leave your bags in a free-while-you-ride locker. This presents our next issue. This is the main entrance to probably the most successful theme park attraction in history. The entrance hall is SMALL. You have the regular line, Express line, and the Single Rider line, all converging in this one tight space that also houses the lockers for every person who wishes to ride (which could probably be hundreds an hour). As with the rest of the WWofHP, is is just too cramped and small. The queue area I have to say is quite neat. The first impressions are not so good, as you go outside to what is meant to be the conservatories, and that is pretty basic with no real attention to detail, which is odd. But, once you are back inside, it really begins. There are some cool scenes starring Harry, Hermione, Ron and Dumbledore and you get to walk through some of the most recognisable rooms from the films. The ride itself is quite thrilling. You soar through Hogwarts and encounter some pretty scary beings form gigantic spiders to some REALLY EERIE Dementors (they truly are chilling). I personally think there should be a warning out front for anyone with a fear of spiders, as that scene is really quite intense. So be warned! The main problem that we had with the ride though is that is was just too dark, literally (not to mention being "dark", too). It was hard to see what was going on, and the projections were really dark, grainy and blurry. I'm not sure why it is like that seeing as this is their newest attraction and they spent so much money on it. Overall we liked the ride, but personally, I would like to think that Disney could have done better if they had done it. Luckily, as we were there during off peak times, we got to ride twice with less than a 15 minute wait each time. To be honest, now that we have rode it twice, and we had such a minimal wait, we won't rush back, and certainly wouldn't wait longer than 15 minutes for it. The rest of IOA is fun, but I feel that the park lacks something overall. Don't get me wrong, we loved spending time there, but it just isn't Disney! I counted only 17 main attractions if you take out play areas and the one ride that is for kids only - and 3 of those are water rides, and 3 are roller coasters! My absolute favourite ride though, in probably any park (including Disney!) is actually at IOA. The Amazing Adventure of Spider-Man still has it for me, even after all these years. The attraction just simply blows you away. The technology is superb and the projections - which were recently upgraded - are crystal clear (which makes it even more bizarre that the WWofHP projections are so bad!). It's a thrilling chase through New York coming face to face with all of Spidey's most feared foes, in a combination of live sets and fantastic 3D. IOA does feature some characters, too, as well as just Winnie and Woody that I mentioned before. At Marvel Super Hero Island you can expect to find Spider-Man, the Green Goblin, Dr Doom, and any number of other heroes and villains from the Marvel comics. At Seuss Landing you can find characters such as the Cat in the Hat, the Grinch, Things 1 and 2, Sam I am, and others. At Toon Lagoon you will find Popeye and Olive Oyl. The characters at IOA were never mobbed or busy. All of them were out regularly, and most of the time waited for people to actually come up to them! Overall, we really liked our time at IOA, but it does need more main attractions to do that aren't water rides of roller coasters. Universal Studios (US) has grown a lot over the years, and since I last visited has been given several new attractions. Since my last visit, Jimmy Neutron's Nick Toon Blast was replaced with the Despicable Me attraction (same ride technology etc though), Back to the Future became The Simpsons, JAWS was torn out to make way for WWofHP part 2 (!) and the Rip Ride Rock It! coaster was installed. They are also working on adding the Transformers attraction from California. They also have a day parade now, and a new nighttime show for Universal's (the parent movie company) 100th anniversary. Sadly though, like IOA, the park suffers from a lack of major attractions. I counted 13 main ones, plus some play areas and the like. On top of that, a lot of them are quite dated now. The Disaster and Twister attractions are undoubtedly fun, but have really seen better days. When the new Harry Potter area opens and the Transformers is complete, I think it will definitely inject some much needed life into the park. The Simpsons ride was the other main attraction besides WWofHp that we both were excited to try. Sadly, I feel that they really let themselves down. The whole thing just screams back to the dated days of Back to the Future. The queue area is badly worked and minimally themed, and the attraction itself is dark and tired looking (despite the in-ride movie being new, the technology isn't). It's not to say it isn't fun to ride, but given so much anticipation and build up, I was disappointed. I would say if you visit and there is more than a 15-20 minute wait, it's probably best to skip it, sadly. The Revenge of the Mummy, despite only being about 7 years old also could do with a serious make-over. It broke down twice (or was it 3?) while we were on it! The most redeeming part of Universal Studios was the characters. They had a LOT, and they were out all the time. We met somewhere in the region of 40 characters over the 2 short days we were there! We met everyone from Betty Boop, Marilyn Monroe, Lucille Ball, the 4 main Simpsons, the Lorax, the SpongeBob characters, Despicable Me characters, Shrek & Fiona, Scooby & Shaggy (much to my happiness! ), Doc Brown (! ), Dora, Deigo and many more! We were quite impressed to be honest. The lines were never long either, and the cast always friendly and willing to help with pictures - and be patient while we took a bazillion photos like we always do! All the characters at UO signed or had a stamper, just like in Disney. A lot of the characters were also in their new day time parade. I have to say that I liked the parade a lot. It had cool characters, and neat music, but it was way too short. I feel bad for them though because they put a lot into it, but hardly anyone was watching it! Definitely not like Disney where you need to be waiting a while beforehand! For Universal's 100th anniversary (in the movie industry of course), they also have a new nighttime show. The Cinematic Spectacular uses fireworks, water based projections and coloured water fountains (sound familiar?). It is definitely a good show, and they obviously put a lot of thought into it. Again, I hate to compare all the time, but isn't quite Disney level, but well worth watching if it's on when you visit. An interesting point also, is that we felt there was an overwhelming number of dining options and boutiques compared to the number of attractions at the parks. You would never go hungry at UO, that's for sure! They had some good deals, and the food was actually better than a lot of Disney counter service places! They also had a meal deal, which we didn't do, but it seemed like it could have been a good deal if we hadn't been on our own tight schedule. Universal also offer their own version of the Disney Dollars, simply called Universal Dollars. The characters on them were Betty Boop, Scooby and Spider-Man. I mention this because, again, I feel bad for them that they do something cool but nobody bothers with it. I of course won't spend them, but they are neat to collect. The lady in guest services even told us nobody EVER asks for them, and they are on the brink of being discontinued. I am glad I got mine when I did! The final thing I want to just point out is that Universal has something akin to FastPass, called Universal Express, but you have to pay for it! In our experience, it simply wasn't worth it. No line we saw was ever over about 30 minuets, and the place already charges more for a lot of things than Disney. Overall I really enjoyed the 2 days away from Disney. It made for a nice change of scenery, and there were things at UO that I had wanted to try for a long time, and am glad that I finally have! We won't be rushing back - though we will return. I would definitely recommend you consider it on your next trip. They DO have some real good rides (sadly just not enough), and some excellent characters, and the cast are friendly and more relaxed than Disney. Sorry if I missed anything, but that's all I can think of for now! We have many pictures to come from the trip that will be added to a newly revamped Universal section of this site soon! So look out for that in the near future! If you have any comments or questions, hit the Discuss button below and reply in the topic thread on the forum for this article.